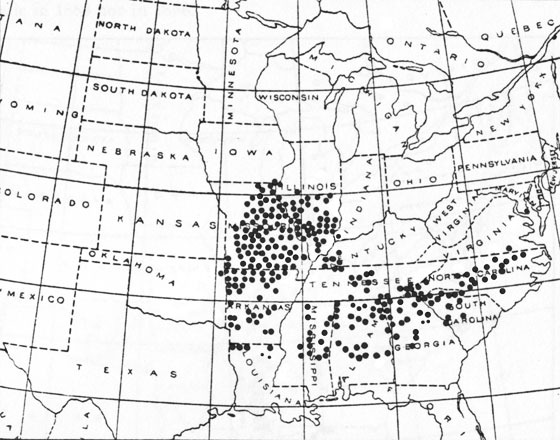 Brood XIX is the largest (by geographical extent) brood of 13-year cicadas. This brood is also notable for including the species M. neotredecim and exhibiting a striking pattern of reproductive character displacement between M. neotredecim and M. tredecim (Cooley et al. 2001; Marshall and Cooley 2000; Simon et al. 2000). Simon, C., J. Tang, S. Dalwadi, G. Staley, J. Deniega, and T. R. Unnasch. 2000. Genetic Evidence for Assortative Mating between 13-Year Cicadas and Sympatric "17-Year Cicadas with 13-Year Life Cycles" Provides Support for Allochronic Speciation. Evolution 54:1326-1336.